When Don Imus, left, went off the air last spring as a result of his racially-charged comments, he retreated to his ranch in New Mexico. When he attempts a comeback soon, his next radio show may have to look to other rural areas for a television audience. Imus is expected to return to radio on WABC in New York, but his return to television may come on RFD-TV, a satellite and cable channel whose focus is rural communities, The New York Times reports. Jacques Steinberg writes that a unnamed source close to Imus said no deal has been signed, but that the two sides are in "serious discussions" about simulcasting the show. "For Mr. Imus, whose previous show on CBS Radio was seen nationally on MSNBC, RFD (which stands for rural free delivery) would offer a lower profile. Mr. Imus used to share a cable network with hosts like Keith Olbermann and Chris Matthews; at RFD-TV his show would be a marquee lead-in to others with titles like 'Cattlemen to Cattlemen' (a 30-minute newsmagazine about the cattle industry) and 'Horse Babies' (an eight-week mini-series)." As a result of incentives passed by Congress in 2005, the drought in construction of nuclear power plants should be ending soon -- and most of those new plants will be appearing in rural areas. No new reactor has opened in the United States since 1996, but concerns about global warming prompted the incentives and thus the jump in construction plans, reports the Daily Yonder. The Nuclear Regulatory Commission has 21 applicants for 32 new reactors, many in the South. It usually takes about 15 years to go from application to an active plant, and some companies are even reopening closed reactors, the Daily Yonder writes. "Reactor sites long ago abandoned are being spiffed up and are headed for full production. The Tennessee Valley Authority, which in 1985 closed its Browns Ferry plant in northern Alabama, will spend $1.8 billion to restart the reactor. Duke Energy left a partially constructed reactor in Cherokee County, South Carolina, two decades ago, but is now coming back." To see a full list of the applications and the proposed reactor sites, go here. A month ago, The Rural Blog reported on SunEthanol, a biofuels technology company in Amherst, Mass., that is working with a bacterium that converts all sorts of plant matter, including cellulose, into ethanol. The company is using research by University of Massachusetts Amherst microbiologist Susan Leschine, who has made it the focus of her work for the past decade and is the chief scientist at SunEthanol. This week, The Washington Post ran a story about SunEthanol and its chief investor, VeraSun Energy, which is one of the nation's biggest producers of ethanol. Like so many others, SunEthanol is working hard to try and make cellulosic ethanol a moneymaker, writes Steven Mufson. "At the moment, they have a way to go. Unlike ethanol made from corn, not a drop of cellulosic ethanol is being commercially produced. Half a dozen pilot projects are being built — with the help of $385 million in Energy Department grants — but no one claims to have a sure thing." Of the 50 states, only Virginia revokes or suspends fewer teaching certificates than Illinois. No investigators are employed by the Illinois State Board of Education, so reports of teacher misconduct are often not investigated or acted upon. The Department of Children and Family Services has found 323 cases providing credible evidence of abuse by teachers, but none have had their licenses suspended or revoked. Teachers hired before 2004 have not had to undergo a state-mandated national criminal background check. Physicians are 43 times more likely than the state's teachers to have their license suspended or revoked. Lawyers are 25 times more likely than teachers to have their license suspended or revoked. None of the tenured teachers fired in the last decade have also lost their teaching certificate and certification officials are not notified when a school district disciplines an educator. In Illinois, Small Newspaper Group owns The Daily Journal in Kankakee, The Dispatch in Moline, The Rock Island Argus and The Times of Ottawa and Streator. Gary and Helen Sosniecki, right, are selling The Vandalia (Mo.) Leader to Lakeway Publishers of Missouri, which already owns eight papers in the state. Lakeway is owned by the Jack Fishman family of Morristown, Tenn., which owns several papers in East and Middle Tennessee under the Lakeway Publishers name. "During the Sosnieckis’ ownership, The Leader won 40 international, national and state awards for journalism excellence, including Gary Sosniecki receiving the International Society of Weekly Newspaper Editors’ Golden Quill Award for editorial writing in 2006," the Leader reported. "In addition, the Sosnieckis each received a National Newspaper Association President’s Award in March 'for public policy leadership to the NNA and community newspapers.' Gary Sosniecki testified on behalf of the NNA before the U.S. Postal Rate Commission last year as the commission reviewed new rates proposed by the U.S. Postal Service," a critical issue for weekly papers. The Sosnieckis spoke at the National Summit on Journalism in Rural America last April about using the Web to do better journalism and make money at it. They said their Web operation was turning a profit. The Summit was held by the Institute for Rural Journalism and Community Issues at the Shaker Village of Pleasant Hill in Kentucky. For a video of their presentation, click here and here. "I will miss publishing The Leader, of course, but I think I’ll miss working on www.vandalialeader.com even more," Gary Sosniecki wrote in his column. He said he loves the Leader, the town, the people and especially its kids, "But, sometimes, love isn’t enough. Sometimes, your body tells you that you aren’t as young as you used to be, that, as you approach your 57th birthday, you’re pushing your body too hard, that 90 hours a week on the job, week after week after week, is too much for it to handle no matter how much you love what you’re doing or the community you’re doing it for. So Helen and I are going to take a break. A good, hard-working and honest family, nationally respected in the community-newspaper industry, is going to buy The Leader on Nov. 1 ... Jack is a native of Jackson, Tenn., and we have joked that the three of us — Jack, Helen and myself — all began our newspaper careers at The Jackson Sun." The U.S. House of Representatives passed a news-media shield bill today that would protect reporters from revealing their confidential sources in federal courts, The Associated Press reports. While the bill would force reporters to name their sources if that information is related to an imminent terrorist attack or matter of national security, the White House threatened a veto saying the privileges "could severely frustrate — an in some cases completely eviscerate — the ability to investigate acts of terrorism or threats to national security." The bill has the support of more than 50 news outlets, including the AP, as well as organizations such as the Society of Professional Journalists. "America is not a country where journalists should be jailed," SPJ President Clint Brewer said. "This bill will allow the working press and those acting as journalists to serve society without fear of reprisal or intrusion from overzealous prosecutors." When the U.S. Office of Surface Mining Reclamation and Enforcement proposed changing a key rule related to mountaintop removal in August, most people affected had plenty to say. As a result, the OSM has scheduled four public hearings — all at 6 p.m., Oct. 24 — in Kentucky, Pennsylvania, Tennessee and West Virginia for people to share their opinions about the proposal. Charleston House Holiday Inn, Charleston, W.Va. Hazard Community and Technical College, Hazard, Ky.
Pellissippi State and Technical College, Knoxville, Tenn. The General Mining Law of 1872 allows hard-rock miners to extract valuable ore from federal land "virtually for free . . . unlike the oil, gas and coal industries, which must pay royalties," but that would change with passage of a bill that a House committee is scheduled to hear on Thursday, writes Margot Roosevelt of the Los Angeles Times. The decades-old debate about the law -- which also gives mining priority over ranching, hunting, fishing, conservation and recreation on federal land -- was heightened this week when the Environmental Working Group said in a release that "A modern-day Gold Rush is threatening California’s national parks, national monuments, wilderness and roadless areas," with more than a third of the 21,300 claims in the state having been filed since July 2003. Parks cannot be mined, but often border other federal land than can be, such as national forests. "Mining is the dirtiest of all resource developments, accounting for more Superfund toxic cleanup sites than any other industry," the Times reports. "It also requires vast amounts of water for the processing of metal ore at a time when shortages are plaguing California and other western states." It's not hard to see how we got to this point. With hundreds of injured coal miners, this area has one of the highest chronic pain rates in the country. For generations we've suffered from all kinds of pain — without the kinds of health services we needed to deal with addiction, poverty, and depression. She recalls watching her fellow high school students crush pills and snort them on their desks, and she says that now she has no "social circle" in her hometown. This "epidemic" has ravaged the community, she says. We're going to live with the human costs of addiction here for generations. Addicts who get clean still won't be able to find jobs in our coal-dependent economy. The mother who finally gets her kids back from the courts won't be able to make up for all the years apart. We have paid for the addiction epidemic with our sisters', brothers', mothers', fathers', grandparents' and friends' lives. The piece is one of the many multimedia presentations produced by Watts for AMI, and more can be viewed at its Web site. To listen to Watts' full essay on addiction, go here. The U.S. Environmental Protection Agency must enforce the Clean Water Act more aggressively to improve water quality in the Mississippi River and the northern Gulf of Mexico, especially because the biofuel boom is causing increased use of fertilizers that cause nutrient pollution in the river and the Gulf, the National Research Council says in a new report. "EPA has failed to use its authority under the act to adequately coordinate and oversee state activities along the Mississippi and ensure progress toward the act's goal of 'fishable and swimmable' waters," a release about the report says. "States along the river also must be more proactive and cooperative in their efforts to monitor and improve water quality." The report urges EPA to work with states to develop tougher water-quality standards, including a Total Maximum Daily Load for nutrient pollutants. Under the Clean Water Act, a TMDL is a numerical limit on the amount of a pollutant that a water body can accept and still meet its water-quality standards. UPDATE: EPA announced Oct. 17 it was creating an advisory committee for agriculture. "EPA had in the neighborhood of 26 various advisory committees, but never one for agriculture," reports Dave Russell of Brownfield Network. Nutrient pollution in the river and the "dead zone" in the Gulf stem largely from use of farm fertilizers in the river's huge watershed, which includes the Ohio and Missouri rivers. "EPA and the U.S. Department of Agriculture should work together more closely to reduce harmful runoff from agriculture," the release says. "USDA's conservation programs for protecting water quality should target areas that contribute higher levels of nutrient and sediment runoff to the river, the committee said. Growing interest in biofuels -- which may increase crop production and therefore nutrient runoff from use of fertilizers -- makes improved EPA-USDA cooperation in the Mississippi River basin all the more urgent." For four years, the Kane County Chronicle of Geneva, Ill., one of its columnists and the chief justice of the Illinois Supreme Court have been fighting over a series of columns that criticized the justice via anonymous sources. Last week the 14,000-circulation paper agreed to pay Justice Robert Thomas $3 million, raising questions about community journalists' ability to hold the judicial system accountable and the system's ability to handle cases involving judges. 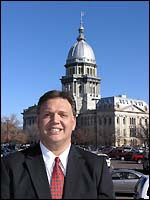 In 2003, columnist Bill Page, drawing from anonymous sources, criticized Thomas (a former Chicago Bears kicker) for how he handled the misconduct case a former Kane County state’s attorney. Thomas filed a libel suit and a jury awarded him $7 million, which a judge later reduced to $4 million. The newspaper, owned by Illinois-based Shaw Newspapers, appealed the verdict. In the settlement, the Chronicle made an apology and said, "The newspaper regrets publishing statements that the jury found to be false and in relying on sources who, based on the jury verdict, provided information that was not true." The story said Page also apologized, but he told The Chicago Tribune that he would "never back down" from his columns. The Chronicle argued that it could not get a fair appeal as long as Thomas still headed the state court. Some of his fellow justices were witnesses in the case. On the other hand, an attack on a judge's reputation can mean a career-damaging loss of respect. But the threat of a lawsuit by someone who is part of the judicial system could lead some to curb their coverage and criticism -- especially if they lack the same level of libel insurance that Shaw Newspapers seems to have. For Tom Musick's story in the Chronicle, click here. Snakes are a routine part of the landscape in Arizona, so many folks think nothing of approaching one -- or even picking one up. As a result, severe bites from Mohave rattlesnakes (at left in a photo from the Arizona Fish and Game Department) in recent months have killed one woman and sent another man to intensive care for five days, reports The Daily Courier in Prescott. Earlier this month, Jackie Ledwell, 63, died a day after a Mohave rattler bit her foot when she tried to stab it with a knife, writes Joanna Dodder. She died after being flown by helicopter to a hospital in Flagstaff. A few weeks before that, Dave Martin, 49, survived a bite on his hand even after suffering a stroke hours afterward. As part of a crackdown on illegal immigration, the Bush administration had threatened criminal prosecution for employers that did not clear up issues with their workers' Social Security numbers, but a federal judge in California has extended an order blocking the move. The ruling has implications for many rural employers, such as those in agriculture and food processing. Homeland Security Secretary Michael Chertoff said he was disappointed by the ruling but said the department would continue to go forward with its effort to heighten enforcement efforts against illegal workers. “We will continue to aggressively enforce our immigration laws while reviewing all legal options available to us in response to this ruling,” he said in a statement. A 2006 report from the inspector general of the SSA said 17.8 million of the agency's 435 million individual records had discrepancies that could send a no-match letter to a legal worker, reports The New York Times. Among those records with errors, 12.7 million were native-born American citizens. Last year, the growth of the ethanol industry doubled the price of corn. In response, many farmers added corn acreage to cash in on the "liquid gold" of ethanol, and now the United States is expecting a record harvest. The haul will strain storage options and that has farmers worried some corn will spoil before it can be delivered, reports Sarah McCammon of NET Radio in Nebraska. In short, there just may not be enough storage bins, trucks or trains to handle the harvest in some areas. That means excess corn will "be left on the ground" in temporary storage until room is available somewhere else. Outside of permanent storage, the corn is subject to changes in weather that could make it worthless. To listen to the short radio report on farmers working overtime to prevent that, via National Public Radio, go here. In a related story, Delta Farm Press reports on the already long waits at grain elevators around the Mid-South. The sometime five-hour delays are due to a bottleneck created by the "triple whammy of high soybean yields, more corn acres and a low river during peak harvest." If an elevator ships by barge, a lower river level means fewer bushels can be loaded onto a barge before it reaches its limit. That creates a domino effect that has some farmers waiting hours outside grain elevators in Mississippi. The distance between rural hospitals and their regional medical centers can make sharing information a struggle, especially in critical situations. In northern Louisiana, a technology initiative is working to bridge the gap, reports The Shreveport Times. The initiative has helped seven rural hospitals use wireless networks and "computers on wheels," at left in a photo by Arely D. Castillo, to connect with the Louisiana State University Health Sciences Center in Shreveport. On Aug. 26, a tornado swept through Northwood, N.D., killing one person, injuring 18 others and destroying 90 percent of the single-family homes in the rural community of less than 1,000 people. The local weekly newspaper, The Gleaner, circulation all of 700, was in trouble after the disaster, but it got some help from journalism students from the University of North Dakota, which is about 40 miles away. The end of American horse slaughter for human consumption, through legislation and legal action, is sending horses to abbatoirs in Canada and Mexico, which ship horsemeat to other countries. It also has increased the problem of abandoned and starving horses, an American Horse Council official told Brownfield Network. The council has formed an Unwanted Horse Coalition to address the issue. "Too many owners are unaware of, or do not give enough thought to, the available options, services and assistance available in the industry to help them ensure that their horse has caring and humane support throughout its life," the coalition's Web site says. It also says, "No accurate figures document how many unwanted horses actually exist," but is certain of this: "The number of unwanted horses exceeds the resources currently available to accommodate them. The estimated cost of providing basic care for a horse ranges from $1,800 to $2,400 annually." For Brownfield's story, click here. For audio of Russell's interview with Howell, click here.